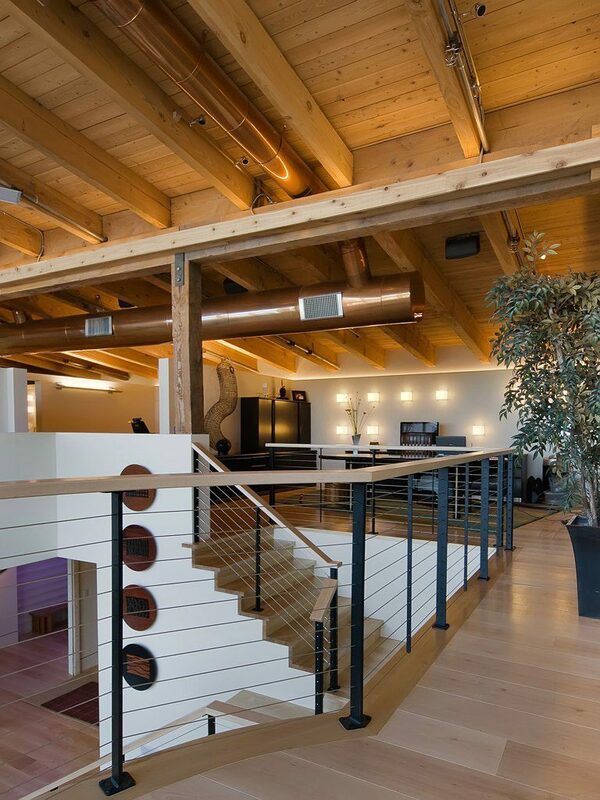 While usually associated with rustic homes, exposed beams have become a feature of many contemporary buildings as well. Just like cable railing, exposed beams are often found in homes with high ceilings and an open-concept design. When combined in one space, exposed beams and cable railing create an open, airy atmosphere. Whether your style is industrial, farmhouse, or modern, the convergence of these architectural features can give your home a cohesive look. For inspiration, check out a few of our completed projects. Keuka Studios designed and built this rustic staircase and cable railing system for an office building in Philadelphia. To match the exposed beam structure, the designers for this project wanted the stairs and railing to have a natural feel. The steel Ithaca Style railing has a clear matte finish that lets you see the natural, straight-from-the-mill look of the steel. Additionally, we used treads made from reclaimed padauk wood that once served as support beams in a factory. This timber frame home in Connecticut features a custom Keuka Studios staircase with our Ithaca Style cable railing. To create a cohesive look, the wood stair treads and the maple top rail match the wood accents around the house. For example, the treads and top rail match the door frames and the kitchen cabinets. These features have a slightly lighter tone than the home’s Douglas fir exposed beams. As a result of this contrast, the home has a unified but not monotonous look. Overlooking Denver’s historic downtown district, this penthouse loft has impressive views and a unique style. The building was constructed in 1882 and has since undergone numerous renovations. However, it still maintains its original architecture. Our client wanted a railing system that would complement the exposed beams but also bring a modern touch to the apartment. Furthermore, they wanted to keep the space open and to maintain the views of the city. To acheive this, they chose our Ithaca Style cable railing with “Raven Black” powder-coated steel posts and a wood top rail. Featuring a half-sized basketball court, an entertainment stage, lounge areas, bunk rooms, and an observation deck for stargazing through a telescope- this rebuilt barn is the perfect entertainment space. Using materials from the original barn structure, the builders on this project constructed a new and luxurious “party barn.” The architecture of the barn includes exposed beams, wood floors, and numerous balconies. In order to create a bright, spacious atmosphere, the architect chose floor-to-ceiling windows, white walls, and Keuka Studios custom cable railing and staircases. For a client in Huson, Montana, we designed cable railings for their home’s interior staircase, catwalk, and balconies. We also fabricated railings for the home’s exterior decks and rooftop lounge. Our team crafted a complete Keuka Style railing system with “Raven Black” powder-coated steel posts and a wood top rail. 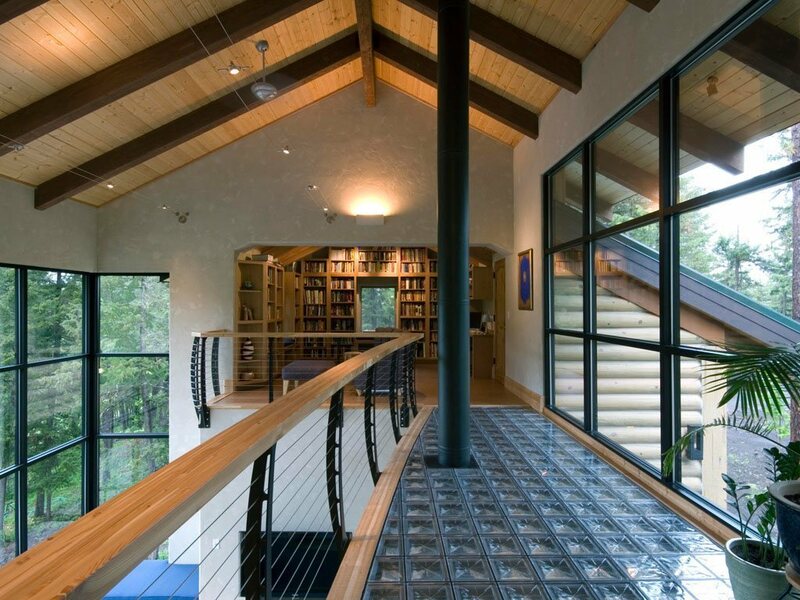 The railing matches perfectly with the home’s exposed beam interior architecture and its concrete log exterior design. In combination with the glass catwalk and large windows, our cable railing gives the rustic home a modern flair.